The use of red and infrared light to relieve pain, accelerate the healing process, and minimize inflammation is known as laser therapy. This soft tissue treatment leverages the photochemistry of light to stimulate physiologic changes in cells. This non-invasive method of treatment allows us to treat our patients in a manner that brings no pain or discomfort. 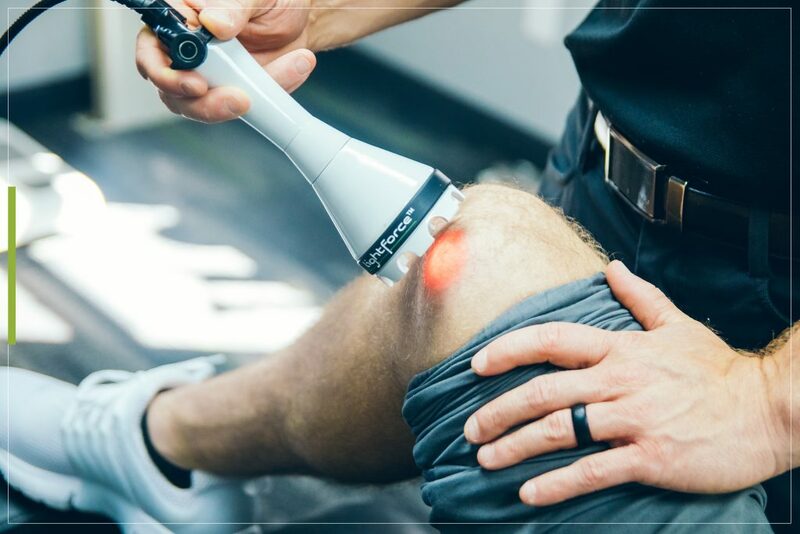 Unlike other physical therapy options, laser therapy treats the underlying condition rather than merely masking the pain or treating the symptom. By getting to the root cause of the discomfort, laser therapy does much more than just temporarily relieve pain. Treatments have a cumulative effect over time for long-lasting benefits. Some patients at our Wexford chiropractic clinic notice an immediate improvement of symptoms and greater range of motion after one single treatment. Others with chronic pain or conditions may require several treatments for optimal benefits. When the light source comes into contact with your skin, photons pierce several centimeters and are absorbed by receptors in cells known as chromophores. These chromophores are located in the mitochondria – the part of a cell responsible for generating cellular energy called ATP that aids tissue healing. Once these chromophores are stimulated by light, blood flow increases to the affected area and new blood vessels also form. Immune cells and fibroblasts are transported to and from the injured area to rid the body of damaged cells and increase the production of ATP. This allows for the production of new healthy cells and accelerates the repair phase of healing. Laser therapy treatments last between 5 and 10 minutes depending on the condition being treated. Laser therapy treatments must be administered directly to the skin, as laser light cannot penetrate through layers of clothing. You will feel a soothing warmth as the therapy is administered. Depending on the condition being treated your therapy may be administered through either a contact or non-contact handpiece. The contact handpiece is designed to allow the practitioner to physically manipulate the tissue while administering the treatment, resulting in a laser-massage treatment. This allows for light to penetrate deeper into tissues than the non-contact handpiece due to its ability to displace tissue through a laser-massage technique. People generally see results after 3 to 5 treatments. Your doctor will develop a treatment plan that is optimal for your condition. Most people see results within 3 to 5 short treatments. LiteCure Medical lasers work by flooding the tissue with photons, which energizes cells resulting in increased circulation to the injured area and ultimately pain reduction. Laser therapy allows your body to utilize its own healing powers by inducing a series of healing responses in your body. During treatment, you will feel a soothing warmth that identifies the beginning of an 18-24 hour process of modulated cellular activity leading to decreased pain and inflammation.